A well designed converter that is capable to convert Lotus Notes NSF file emails to MS Word documents. It can export all Lotus Notes mail folder to Word file within few seconds. By using NSF to Word converter users can convert selected mails and folders from Lotus Notes email client to Word. Check or Un-Check the desired mail and folder while conversion. Emails that contain crucial links, images and documents are safely migrated to Word from NSF file. Software maintains the 100% data integrity after NSF mails converted to MS Word. Lotus Notes to Word Converter retains the entire information associated with NSF emails like To, Cc, Bcc, Subject, Date & time. No data will be deleted or modified during migration. When conversion is in process software offers preview and entire conversion report of NSF to Word Conversion. It shows converted items with subject and current status of mails. As soon as you load NSF file, software start scanning and extract all Lotus Notes NSF mails from target file. Also check the configuration setting and number of mails in NSF files. Convert NSF in Word: Involving in legal profession like lawyer advocates or works in forensic investigation department where you need your documents carried in Lotus Notes mailbox. Lotus Notes email cline is system specific and you need some of your email data you required as you have to present them in written form. So, if you convert them into Word then it is possible that you convert NSF mail data in Word. This way you carry your data wherever you want. 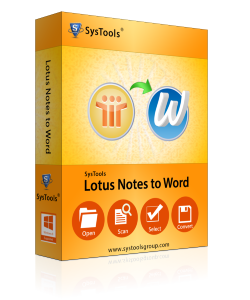 Lotus Notes to Word Converter will help in converting Lotus document to Word. This converter is known for entire conversion from Lotus Notes to doc and docx files. It gives you complete ease while conversion from NSF to doc or docx. Instant NSF to Word conversion is what it aims at. Provision for accessing scan details with the usage of this external converter. rovision to preview NSF folders in hierarchical order as you selects a particular folder having entire email data in them. This apparatus can convert ANY number of mailbox folders as it is not limited. The doc files or docx files created from Lotus Notes mailbox will be saved at a particular folder on your users friendly. Features and process to convert NSF emails to doc or docx would be possible for you to access. Trial tour will convert 10 emails per NSF folder to MS Word. Does software possess any limitation on NSF file size to convert as Word files? No, users can convert NSF file of any size to word files by using this tool without facing any technical issues. Can we convert email attachments too in word files using this tool? Yes, tool support to convert embedded attachments of NSF files in Word documents in its original forms. Is Lotus Notes required for migration of NSF as Word files? Yes, it is necessary to install and configure Lotus Notes email client in system to convert NSF file emails as Doc files? Which version of MS Word application software supports? Users can convert Lotus Notes NSF file emails in Doc files which is compatible in word 2007 and above versions. I have need of only migrating selected emails from NSF file in Word format, I have contacted support department, and they have provided me guidance to invest inpersonal license of Lotus Notes to Word Converter tool. Once I invest in licensed version of tool it helped me to migrate only selected emails as per my choice. Thanks! Lotus Notes to Word converter is superb tool that helped me to migrate NSF file emails as Word files in its original folder hierarchy. All emails are in its original format without any changes and alterations, keep it up guys! I have only one word for tool which is excellent! It migrated all my emails from Lotus Notes NSF file to Word format along with email attachments in their original forms. Now I have separate email for each NSF email that I can easily import in plenty of supportive email client.